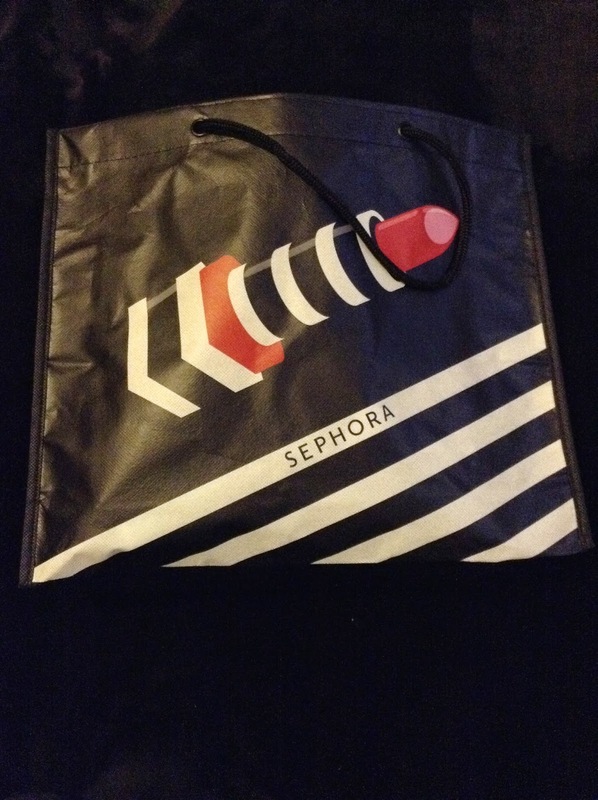 Coral's Cove: Sephora VIB Rouge Holiday Soirée! Sephora VIB Rouge Holiday Soirée! Halloween has come and gone which means the retail world is gearing up for the busiest season of the year! The holidays are just around the corner and stores and changing their windows and bringing out the snowflakes, candy canes, Christmas lights, and the dreaded Christmas music. The holiday season is one of my favourites because everyone is reunited and can take a few days to relax with loved ones. Just as I was putting my Mary Poppins costume away I got an email from Sephora inviting a friend and I to their VIB Rouge holiday soirée! 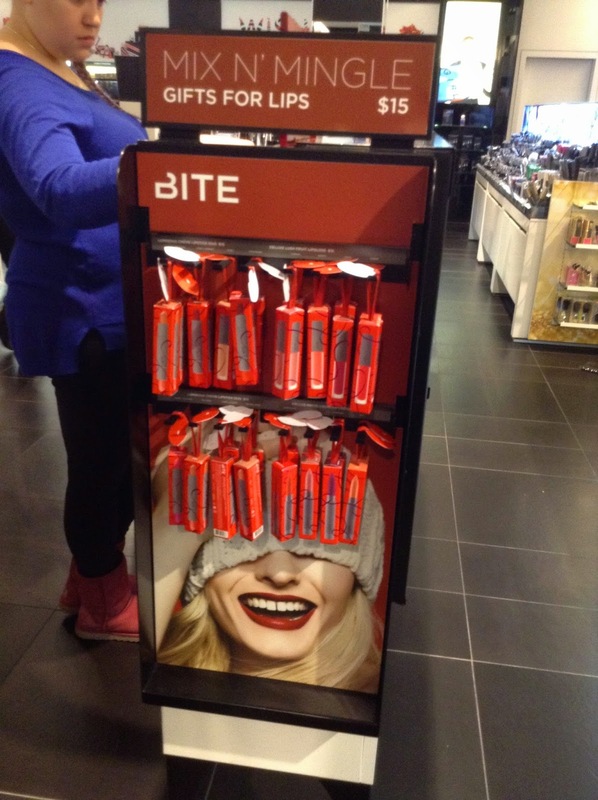 The event was held last night at Sephora locations across the country. 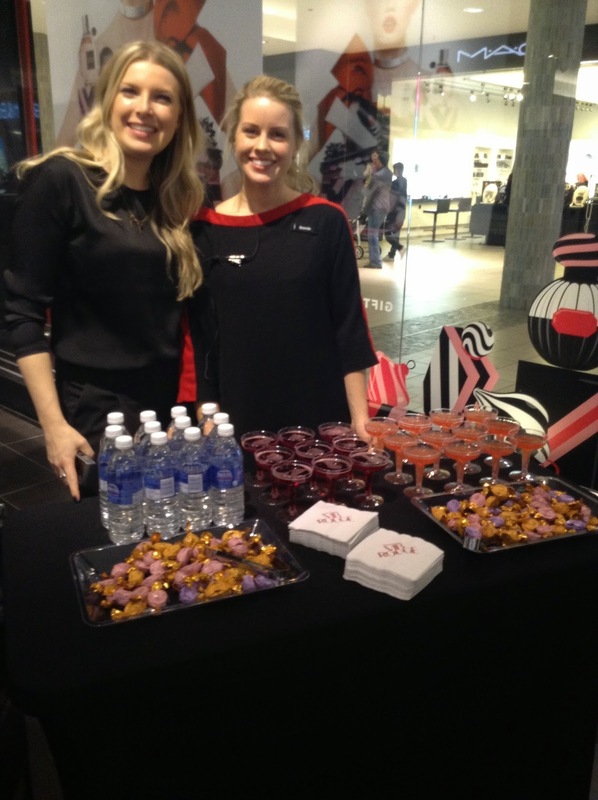 The stores were closed for the event, allowing invited guests to enjoy treats, drinks, makeovers and of course shopping! 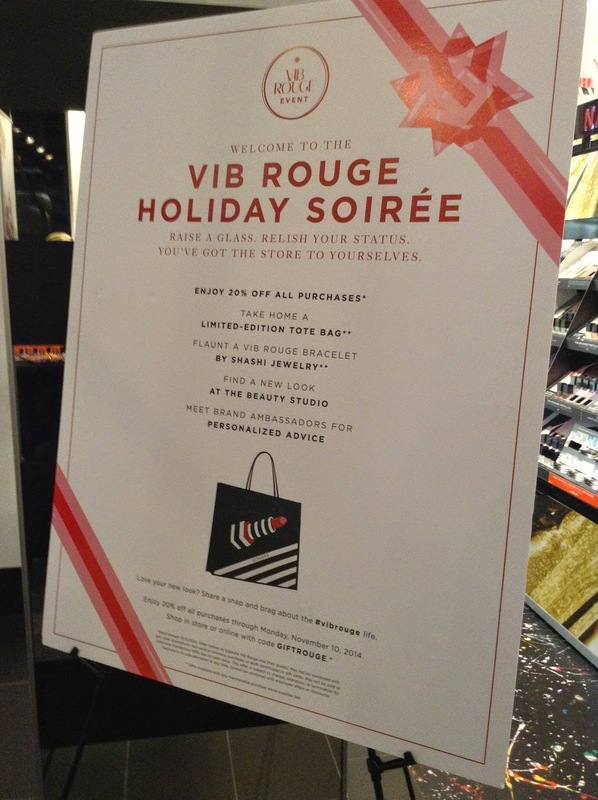 The event is used to kick off the VIB and VIB Rouge holiday discount offered every year in early November. VIB and VIB Rouge members get 20% off all purchases from Nov. 6 - 10. When I arrived to my local Sephora the store was closed and the employees were working like busy bees to prepare the store for the event and do all the last minute finishing touches. A crowd of beauty addicts like myself had already begun to wait outside the doors to makeup paradise. Once the doors opened, each guest was signed in and the shopping began! A table of chocolates, water, and sparkling juice were beautifully displayed for guests to consume while browsing the large array of products. 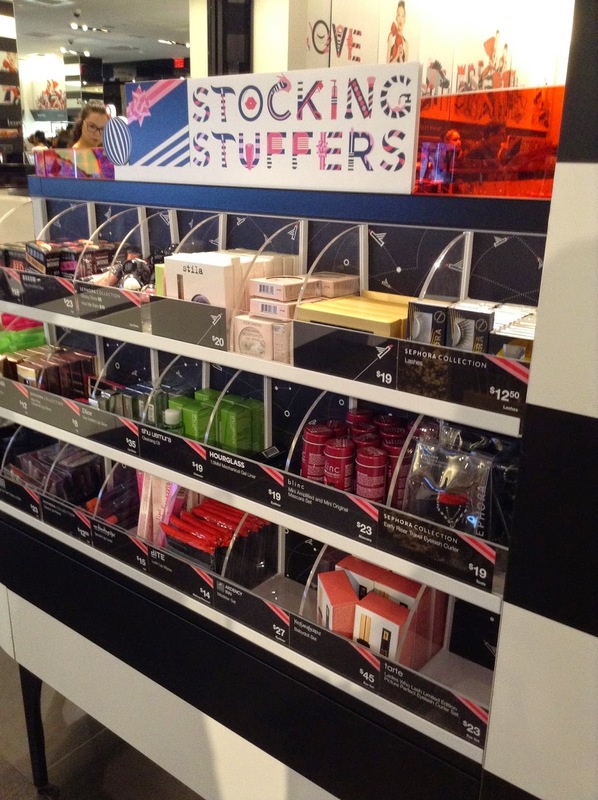 The new limited edition holiday products were scattered throughout the store. Most of the holiday items were stocked well except of course one of the items on my list (isn't that always how it is?). 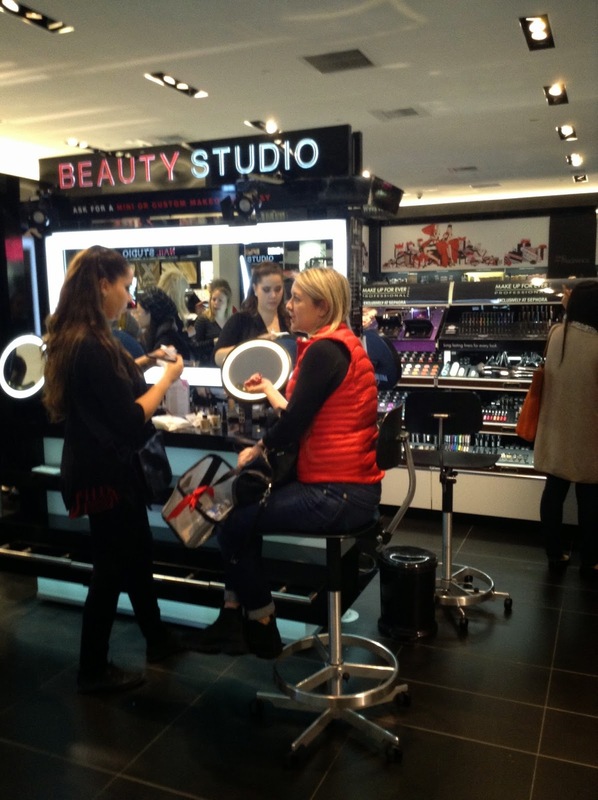 At the beauty studio and certain areas of the store, makeovers were being offered to guests. There were many staff available to help guests find products, the perfect shade, offer advise, etc. There were even brand representatives present to answer any questions about their products. I went into the store with a list of items and a game plan! Last year Hourglass had released a limited edition palette of their popular ambient lighting powders. I had planned (along with everyone else) on purchasing the palette during the holiday sale but it was sold-out within minutes! I did finally get the palette when it was re-released as a permanent product at Sephora, but I didn't want to miss out again this year. The items on my list were the Tarte Pin Up Girl Amazonian Clay 12-Hour Blush Palette, the Hourglass Ambient Blush Palette, and the Benefit Cheeky Sweet Spot Box O' Blushes (can you tell I'm into blush at the moment?). I really wanted to make sure I got my hands on the Hourglass Ambient Blush Palette so I headed to the Hourglass section first. Luckily the store had several palettes in stock! I then picked up the TartePin Up Girl Amazonian Clay 12-Hour Blush Palette which I saw a stack of near the front of the store. Finally I went to look for the Benefit Cheeky Sweet Spot Box O' Blushes and found an empty space where I had seen the palette before. Unfortunately they were out of stock but the store put my name down to call when they get more in stock. After I had picked up the items on my list I took some time to browse the store, have a drink and enjoy the party! Everyone was so excited to be shopping all the new products and of course getting the 20% discount! By the time I was in the checkout line I had also picked up the NARS Light Reflecting Pressed Setting Powder and the Smashbox Foundation Primer Light that I had been eyeing for quite some time now. At the checkout I received a cute reusable bag, Sashi bracelet, packet of samples, and I used some points to get a mini sample of the Diorshow Iconic Overcurl Mascara. Overall the event was a fun way to shop the new holiday products and get excited for the holiday season!